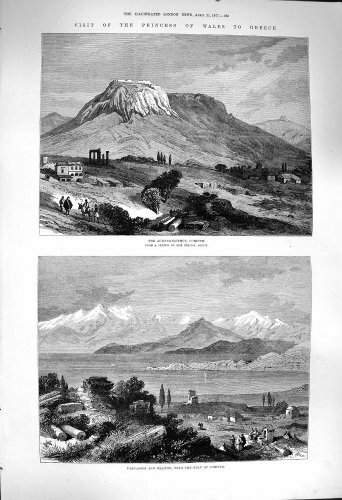 Old Original Antique Victorian Print 1877 Acro-Corinthus Corinth Greece Parnassus Helicon An antique page print from the Illustrated London News. Date if known in the title. The size of each single page print is approximately (including margins as seen) 10 x 14.5 inches (260x370) and the size of each double page print is approximately 20 x 14.5 inches (510x370). All prints are genuine antiques and not modern reproductions. Please check images carefully for any foxing and wear that may have occured over it's long lifespan.